Resembling a delicate rose floating in space, the nebula N11A is seen in a new light in a true-colour image taken by the NASA/ESA Hubble Space Telescope. Fierce radiation from massive stars embedded at the centre of N11A illuminates the surrounding gas with a soft fluorescent glow. N11A lies within a spectacular star-forming region in the Large Magellanic Cloud, a small nearby companion galaxy to our own Milky Way Galaxy, visible from the Southern Hemisphere. This nebula is particularly interesting for astronomers since it is the smallest and most compact nebula in that region and represents the most recent massive star formation event there. 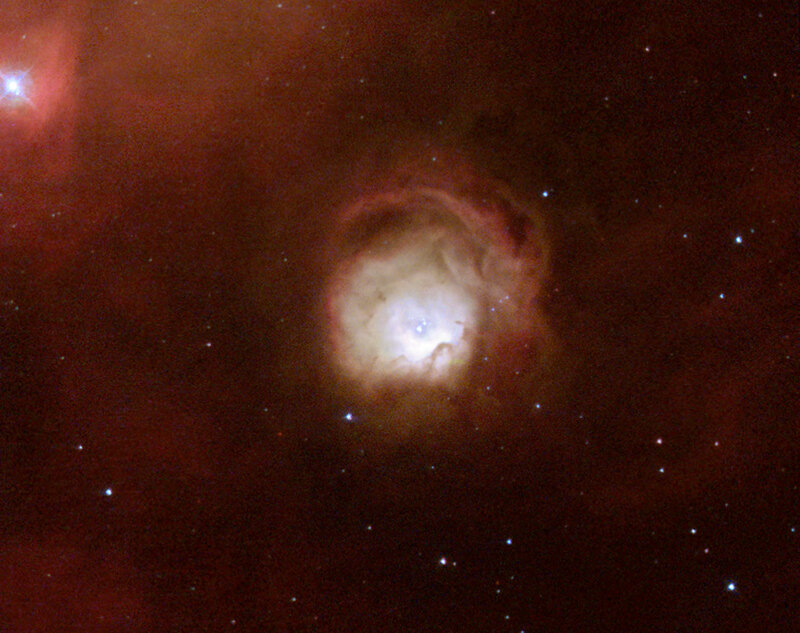 The excellent imaging power of Hubble has enabled astronomers to see this nebula in more detail and to study the structure of the hot gas envelope as well as the stars embedded in its centre. Shocks and strong stellar winds from the recently born, massive stars in the bright core of N11A have scooped out a cavity in the gas and dust. The fierce radiation causes the surrounding gas to fluoresce in a way similar to a neon light. Hubble's image provides a much clearer picture of the nebula, making it possible for the first time to identify the stars that actually make it glow. Such information is essential for a better understanding of the formation of massive stars, that is, stars more than 10 times as heavy as our Sun. 'We need to study the properties of star-forming regions in our neighbouring galaxies to understand how stars are formed in the distant, young Universe,' explains Mohammad Heydari-Malayeri who led the team studying these Hubble observations. N11A is located in the constellation of Dorado (the Goldfish). This true-colour Hubble image is composed of three narrow-band filter images obtained with Hubble's Wide Field Planetary Camera 2 on 17 May 2000. The three images were obtained using a 1040 second exposure through a red filter (ionised hydrogen, H-alpha), a 1200 second exposure through a green filter (ionised oxygen), and a 1040 second exposure through a blue filter (ionised hydrogen, H-beta). N11A is about 10 arc-seconds in size, corresponding to about 8 light-years at the distance of the Large Magellanic Cloud (168 000 light-years). The scientists involved in these observations are M. Heydari-Malayeri (Observatoire de Paris, France), V. Charmandaris (Cornell University, U.S.A.), L. Deharveng (Observatoire de Marseille, France), M.R. Rosa (ST-ECF, Germany), D. Schaerer (Observatoire Midi-Pyrenees, France), and H. Zinnecker (Astrophysikalisches Institut Potsdam, Germany).